Old Crescent opens 2 new dedicated Under Age pitches! Tim Duggan, President of Old Crescent RFC cut the tape to officially open two new Under Age pitches at the Club grounds in Rosbrien today, Sunday, 17 September 2017. The new pitches have been developed on a section of the 11 acres of adjoining land that were acquired by the Club two years ago. 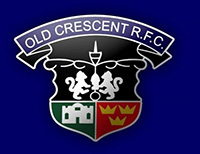 Speaking at the official opening, Tim Duggan, said “Just two years ago, in the most exciting club development since we moved to Rosbrien 35 years ago, Old Crescent RFC completed the purchase of 11 acres of land adjoining our club grounds which saw our grounds double in size, securing the future of rugby at Rosbrien for current and future generations. Tim Duggan congratulated the Club’s Grounds Committee, led by Chairman Dermot McGovern, for their hard work over the last two years, clearing and developing the new lands, to the stage where the Club has a third newly laid full size pitch and training area, and now two new dedicated Under Age pitches, on the new land. 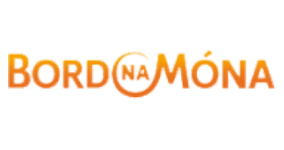 He added “The growth of Under Age rugby in Old Crescent has been phenomenal in recent years, and for that we must thank our hard working Under Age Committee, led by Chairman Anthony O’Dwyer, and his dedicated team of Under Age coaches and mentors. We also thank the parents who have been hugely supportive”. President Tim Duggan concluded “As we approach our 70th anniversary, Old Crescent has never been in a stronger or more secure position at adult and under age levels, on and off the field. 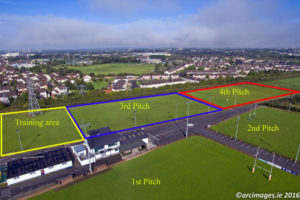 Doubling the size of our grounds here at Rosbrien has enabled the development of these extra pitches to cater for the growing popularity of adult and youth rugby, and of tag rugby, at Old Crescent, and for the expansion of major Club events such as our annual Pig n Porter Tag Rugby Festival and our new Limerick Summer Music Concert event”. 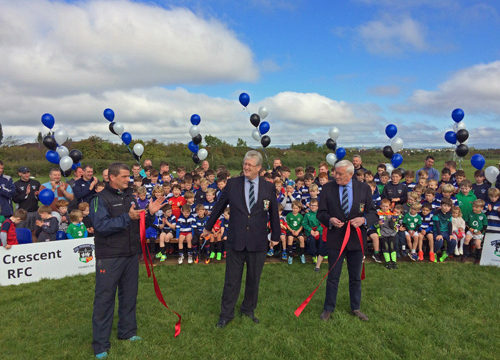 Pictured at the tape cutting ceremony were, l-r, Anthony O’Dywer, Under Age Chairman, Tim Duggan, Club President, and Dermot McGovern, Grounds Chairman, in front of a gathering of enthusiastic young players from Old Crescent RFC.